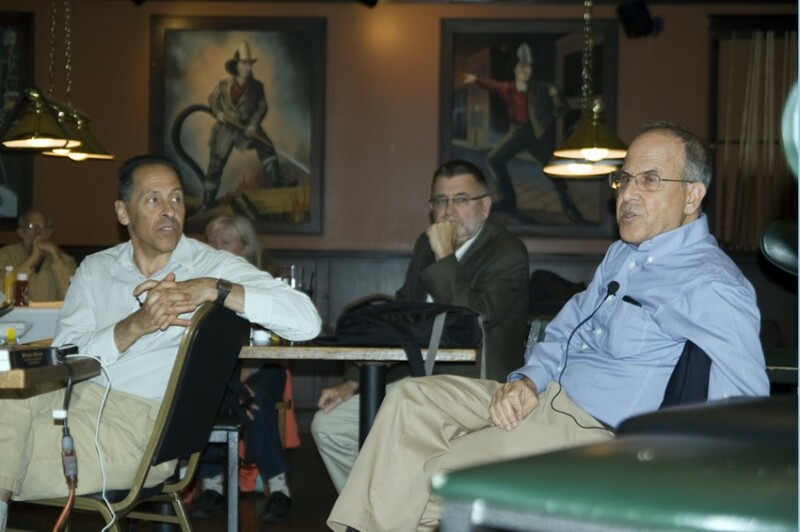 Law Prof. Andrew Koppelman, History Prof. Peter Hayes and English Prof. Carl Smith discuss the findings of the John Evans Study Committee at Firehouse Grill. The three professors were part of the eight-person committee that was tasked with determining whether John Evans played a role in the Sand Creek Massacre. Members of the John Evans Study Committee gathered Tuesday night to inform Evanston residents and Northwestern students about findings in their May report on John Evans’ relationship to the Sand Creek Massacre. Three of the eight members of the committee presented the report and answered questions in front of nearly 45 people at Firehouse Grill, 750 Chicago Ave. The event was part of Science Cafe, a monthly event that brings NU research topics into the Evanston community. The committee was formed in 2013 to investigate the role University founder John Evans played in the Sand Creek Massacre and whether NU benefitted financially from Evans’ actions. More than 100 Cheyenne and Arapaho people died during the 1864 massacre, which took place in the Colorado Territory while Evans was governor. In May, the committee released its report and found no evidence Evans was directly involved in planning the massacre. The committee did conclude that the University ignored his “significant moral failures” regarding his treatment of Native Americans. English Prof. Carl Smith, who chaired the committee, began the event by giving a brief overview of the study, highlighting Evans’ career and his role in the founding of NU. Residents and students then asked the three professors a variety of questions on Evans’ actions, the details of the Sand Creek Massacre and NU’s relationship with Evans. History Prof. Peter Hayes discussed the importance of studying Evans’ role in the massacre. Hayes, who often teaches a class called History of the Holocaust, said the study of history gives important insight into how people behaved in the past. He said that while he cannot guarantee knowledge of the past will prevent future atrocities, he was confident that without studying history, future atrocities could not be prevented. One attendee asked the professors what actions NU and Evanston should take to address Evans’ role in both NU and the city’s history. Smith said the University and the city need to do more than take symbolic actions such as removing his name from buildings. Weinberg senior Heather Menefee, who previously served as the co-president of NU’s Native American and Indigenous Student Alliance, was among the students who attended the event. Menefee is part of the Native American Outreach and Inclusion Task Force that was formed to understand and improve the Native American community’s relationship with NU.